Macomb Area Crime Stoppers (11/30/2017) - The Pro-Tektor®, Inc.
MACOMB — Macomb Area Crime Stoppers has gained a new tool for getting its crime- and public service-related messages out to the public. The kiosk displays information including public service announcements, safety tips, most wanted criminals, missing people and date/time/weather information. Of course, the kiosk also displays information on how the public can report crimes anonymously to Macomb Area Crime Stoppers. Cremer said the new technology allows for the kiosk to be updated wirelessly via a program on authorized individuals’ smartphones. This new feature allows for updates to the kiosk and Crime Stoppers’ newly redesigned website with less time and greater ease. The wireless feature and smartphone access allows law enforcement in some areas to more easily communicate with the public across jurisdictions. Up to three videos can be played at a time with the included program. The more common locations for such kiosks in Florida are at Target and Wal-Mart stores — places where the public frequents at a high rate. According to Cremer, the kiosk and technology have been utilized in Florida, Georgia and Louisiana for some time now, and the Macomb kiosk marks one of the first to be introduced in Illinois. 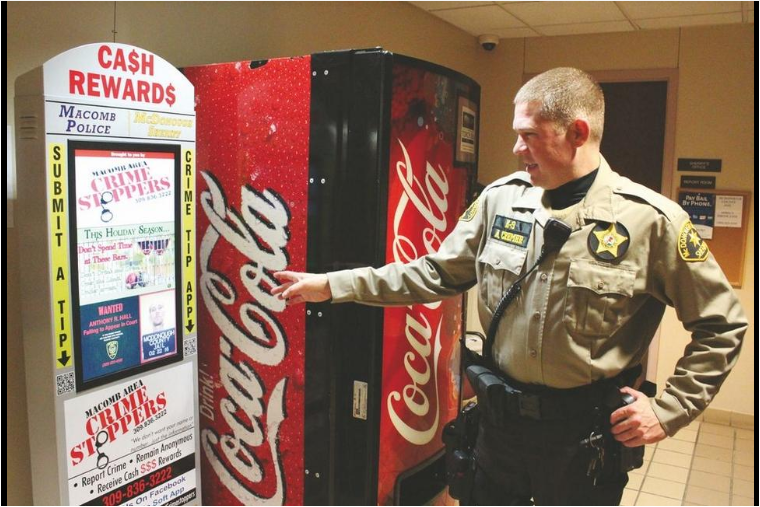 Macomb Area Crime Stoppers purchased the kiosk at a cost of $4,500. Cremer said the idea is to eventually have five or six located around the county at strategic locations — such as a major store or gas station. The outside of the kiosk box is also outfitted with decals for QR codes directing how to submit tips online or to initiate the download of a smartphone app. Free QR and bar code readers can be downloaded from Apple Store or Google Play Store via smartphone. Macomb Area Crime Stoppers’ newly redesigned website can be found at: https://www.mcdonoughcountysheriff.com/crime-stoppers. The site features areas to submit anonymous tips, donate to the organization and download the latest warrant list. The organization offers cash rewards for anonymous tips leading to arrest and conviction of individuals.